Can I return items that I've decided I don't want or need? You may request to return an item in the condition it was received if you change your mind. Depending on the seller’s stated return policy at the time of purchase, your refund may be reduced by restocking fees or return shipping costs. To start a return, find the item in the purchase history section of My eBay. Select Return this item. The seller is notified of your return request and will send you a return shipping label if they are paying for the return. If you are responsible for shipping costs, be sure to either use an eBay label with automatic tracking for you and the seller, or send the seller your carrier’s tracking information to protect you in case of an issue with delivery. Next, pack the item carefully. Include the packing slip, affix the shipping label, and send the item back to the seller within five business days of starting the return in My eBay. You can drop the package off at the post office or schedule a pickup with the US Postal Service or designated carrier. If the seller is paying for return shipping and the return is being handled through the standard returns process on eBay, you’ll automatically receive tracking information. If it’s not handled through eBay, or if you are responsible for return shipping, you need to send tracking information to the seller to protect yourself if there’s an issue with shipping/delivery. If you have an international return, you should communicate directly with the seller about return shipping and tracking. Once you've shipped your package back to the seller, you can track the status of the returned item in the Purchase History section of My eBay when it's being handled through the regular eBay returns process. The seller should issue your refund within six business days after the return item shows "delivered" in the tracking info. If you've not received your refund after 6 business days, send the seller a message to discuss. It depends on the reason for the return and the seller's return policy. In most cases, sellers designate that the buyer will pay for return shipping and any restocking fees if specified in their return policy. Some sellers offer free return shipping. If the item is damaged or not as described, sellers must cover return shipping costs. When you're responsible for return shipping charges, we'll charge your PayPal account if the item is shipped with an eBay label. For more details, click here. In most cases, the seller will issue your refund within six business days after receiving the returned item. For more details, click here. What if the seller does not give me a refund? If you haven't received a refund six business days after the item tracking shows the item delivered back to the seller, contact the seller directly or use the "Ask the seller a question" feature next to the item in your purchase history. 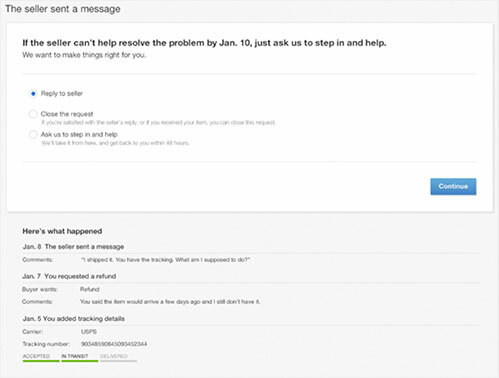 If you can't resolve the issue with the seller, you can ask eBay to step in and help. Can I return an item if I've used it? For more details on specific item categories, click here. What if I missed the seller's return timeframe? If it's too late to start a return, it's up to the seller to decide whether or not he or she will accept a late return. Contact the seller for more information. For more details on returns, click here. What if I started a return on time but did not ship the item on time? If five business days have passed since you started a return and you haven't sent the item back to the seller yet, contact the seller to see whether he or she is still willing to accept your return. For more details on returns, click here. Exchanges are not supported on eBay.com at this time, but you can ask the seller via My eBay to see if the seller may be willing to make an exchange instead of a refund. For example, if you ordered a men’s blue shirt, size large, but you want a men’s blue shirt, size medium, ask the seller if he or she will do a direct exchange. I received my item and need a replacement. What should I do? A replacement is an item that is exactly the same as the original item was described in the listing. For example, if you ordered a men’s blue shirt, size large and there is a flaw or problem, and you want an identical item—men’s blue shirt, size large—that would count as a replacement. When the seller has specified in his or her listing that he or she offers replacements and you’d rather receive a replacement than a refund, you can request one the same way you would a refund through My eBay. Ship the original item back to the seller within five business days of requesting the replacement. The seller will also ship the replacement item within five business days of receiving your item. I see an item from an international seller that I want to purchase. What if I need to return it? International returns cannot be fully handled through the standard eBay returns process at this time. It's best to contact the seller directly if you have any questions about their return policy. Can I contact the seller first before returning the item? The easiest way to initiate a return is through My eBay in purchased items. However, you can contact the seller with any questions or if you are unsure of making the return. Can I return more than one item in a single return? You may only return multiple items if you purchased a multi-quantity item from the same transaction. If not, then you must initiate a return for each item individually. No, the eBay Money Back Guarantee is automatically included with the purchase of virtually every item on ebay.com. What’s covered by the eBay Money Back Guarantee? 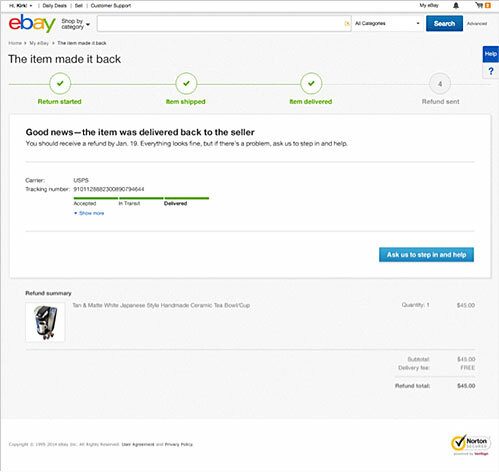 The eBay Money Back Guarantee protects you in case you do not receive your item, or if the item is not as described in the listing. Vehicles, real estate, items sold by Sotheby's, websites and businesses for sale, classified ads, and services are not covered. Some business equipment categories are also excluded—though they may be covered by the eBay Business Equipment Purchase Protection. For the complete details, see the eBay Money Back Guarantee policy. No. eBay Money Back Guarantee covers other electronic payment methods as well, when they are used in eBay Checkout, including ProPay, Skrill, Bill Me Later, credit card, and debit card. If I paid for my purchase with PayPal and something goes wrong, should I file a PayPal Purchase Protection request or an eBay Money Back Guarantee request? You can use Money Back Guarantee up to 30 days after you received your item (or when you should have received it). After 30 days, file for PayPal Purchase Protection in your PayPal account. PayPal offers a 180 day window for coverage of items that are not as described or not received. I received an item but it doesn’t match the listing description. If you received an item that’s incomplete, damaged, counterfeit, or otherwise not as described, request a return from My eBay. We will track the resolution and help if you ask us to step in. I haven’t received an item. Your item’s arrival time depends on the shipping method you chose when you bought the item. To review the estimated delivery time, go to My eBay and look up the item you ordered in your purchase history by clicking More actions > View order details. If the seller provided you with tracking information that shows your item was delivered, please check the address you provided in your order details or ask a neighbor if he or she might have received the item meant for you. If the estimated delivery time has already passed and you’ve double-checked the delivery details, contact the seller by selecting the “contact the seller” option in the more actions drop down menu under your purchase history. The seller didn’t resolve my issue—how do I ask eBay to step in and help? The seller resolved my issue or asked me to close my request. What should I do now? If you’re happy with the solution from your seller, and you don’t need eBay to review your request, go to My eBay and close the request. Before you close the request, you should make sure it’s fully resolved—for example, that you received all refunds promised. Once a request is closed, it’s not possible to open it again. What does opening a “request” mean? 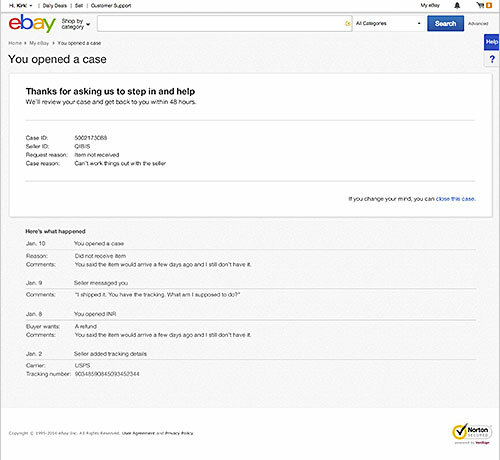 If you are not able to resolve an issue with a purchase directly with your seller and you request eBay to step in and help resolve an issue after the sale, a “request” is opened on your behalf. You can track the progress of your request and will be notified of the resolution. Seller’s return window: Review the seller’s return policy and return window before you make a purchase. If you did not receive the item, or the item is not as described, you have 30 days from your actual or latest estimated delivery date to open a request, under the eBay Money Back Guarantee. We review all the information we have about a case and make a decision based on the policy we have in place. You can read the policy in more detail here.